1. 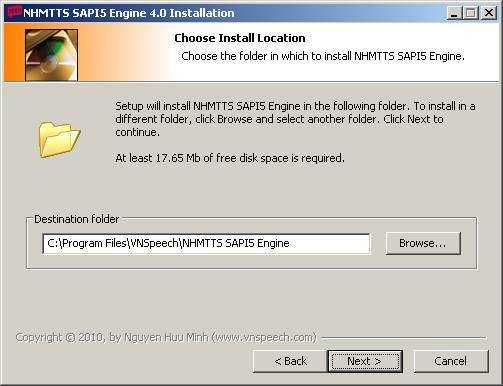 Visit website http://www.vnspeech.com to download NHMTTS SAPI5 4.0. Click on Run button when the download dialog appear. 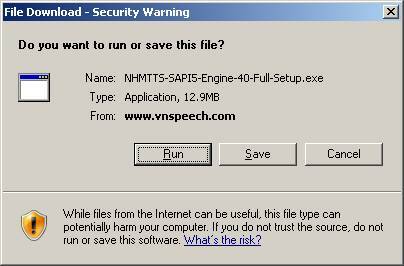 The security warning dialog may then appear, continue click on Run button to install the software. 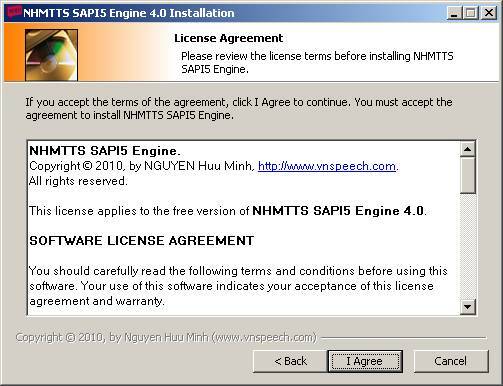 Click I Agree button if you have read and accept the License Agreement. 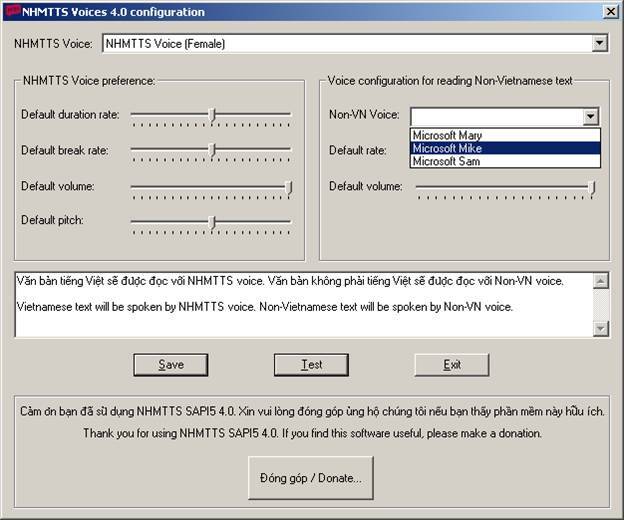 First chose NHMTTS Voice (Female) from "NHMTTS Voice" drop down list to configure for the female voice. 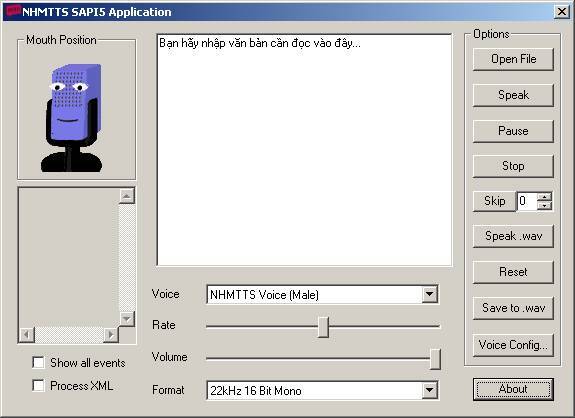 - Chose suitable voice for alouding non-Vietnamese text from "Non-VN Voice" drop down list. 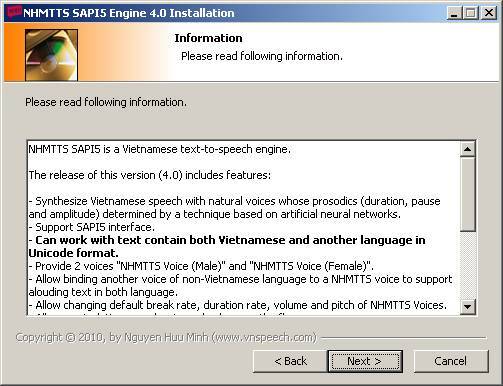 If there is no suitable voice on your system for alouding the non-Vietnamese langue, you may need to install one from 3rd party providers. - You can modify the sample text and click on the Test button for testing voices. - You can also modify other voice parameters include rates, volume, pitch... to find best prosody. 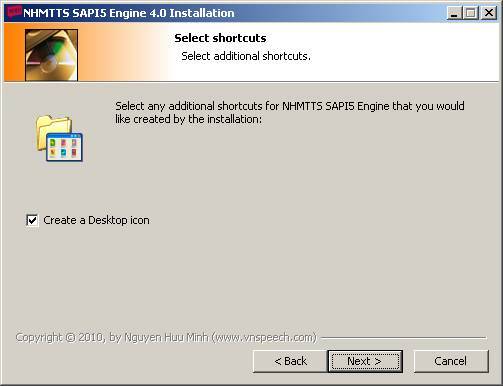 - Click on Save button for storing your configuration. - Then you chose NHMTTS Voice (Male) from "NHMTTS Voice" drop down list and do the same previous steps to configure for the male voice. 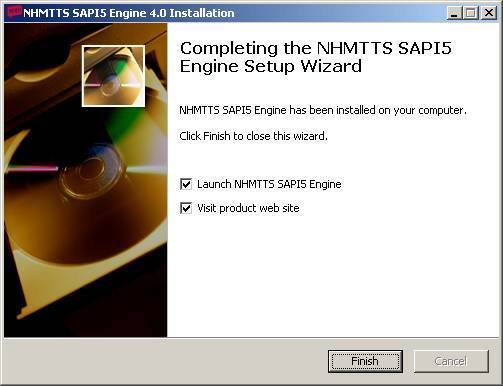 - When you finished configuration for NHMTTS Voices, you can use NHMTTS SAPI5 Application or 3rd party speak softwares which support SAPI5 like Jaws, NVDA, â€¦ and select NHMTTS Voice (Male) or NHMTTS Voice (Female) to aloud your text. - You can typing/paste text to the input box or click Open File button to open your .txt file (Note that all text must be in Unicode format). - Select NHMTTS Voice (Male/Female) from Voice drop down list. - Modify rate and volume by moving the suitable sliders. - Select wav output format from Format drop down list. - Check on Process XML box if your input is XML script. 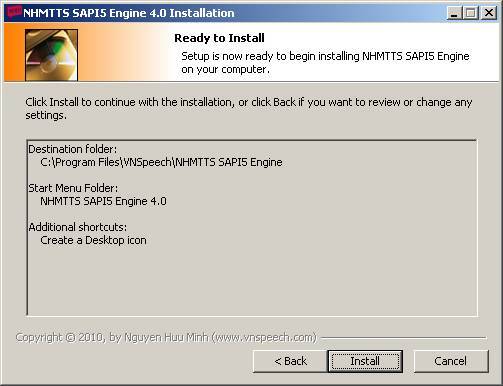 - Click on Speak: to aloud text, Pause/Resume/Stop: to pause/resume/stop text alouding, Speak .wav: to open and play a wav file, Save to .wav: to generate speech to wave file, Voice Config: to lauch NHMTTS Voice Configuration application.